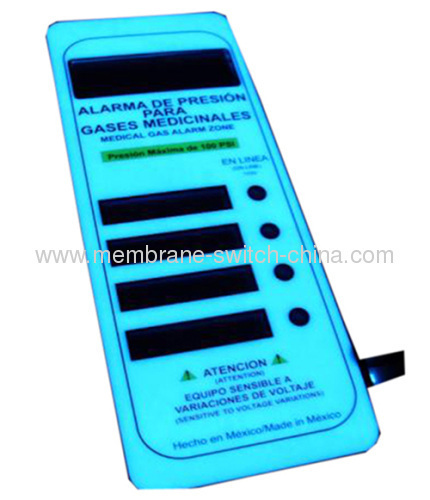 Notice: We have the capacity to provide you membrane switches with other special requirements, such as Shielding, Windows/Lens Coating, Embossing, Embedded LEDs, UV glossy/matte/textured, etc. FRI and ESD shielding: Available in most configurations. 1.Beautiful appearance, rich and bright in color, design can be arbitrary, the products can fully reflect the individual style of the product itself and designer. 3. Small size, light weight, thin thickness, good tactility, abrasion resistant, installation and connection convenience. 5. Low cost, high lifespan, membrane switches design and manufacture are using the keyboard as a whole way, whether on the material or mold charges, the costs are lowest, the life expectancy of different types of membrane switch is more than 100 million times. 6. Easy to operate, intuitive, safe and reliable, In-house 100% functionally tested, components are guaranteed without any intermittent problem. 7. Customized specification is available and keys can make different shapes.